Bioroids and Bombots: Defensive Weapons for Military Spacecraft. In my previous post I commented that a large military spaceship was more likely to look like the Graf Zeppelin than the USS Missouri. Another reason for this statement is that the spaceship will not be brisling with gun turrets and long-barrelled guns. The actual laser weapons will be mounted deep inside the ship where they are better protected and can be more easily maintained. The external turrets on the ship’s surface are in fact gimbal-mounted reflectors. The reflectors are linked to the laser weapons by a system of light ducts and mirrors that transmits the laser beam to them for final focusing and direction. It has been suggested that a ship only really needs a single laser weapon connected to two turrets, one of each side. One can fire while the other acquires a new target. For a large spacecraft some redundancy is prudent. The larger ship designs I have illustrated below have two or three internal laser batteries attached to eight turrets, one on each corner of the ship. By such an arrangement at least four turrets are engage targets at once in any direction. This is also consistent with the options given in Spaceships (4e) and Spaceships 8. The two to eight main laser turrets will be supplemented by smaller, shorter-ranged rapid fire and very-rapid fire laser systems. It is quite possible that laser-generators of differing outputs could share reflectors. Lasers and other directed energy weapons are limited in range and their primary function is defensive. Even if a laser or other directed energy weapon can destroy a target at long range the complications of actually hitting the target are going to limit the practical range of such a weapon to a light-second or less. In the Transhuman Space (3e) p.102 it is stated that the maximum practical size for a laser mirror is 9 feet giving a practical focusing range of 5,000 miles. Even at these ranges the reflector turrets will need to make adjustments of fractions of a degree in accuracy. This is another reason why laser batteries are internally mounted to keep the mass of the turrets low. A ship’s laser systems might be complimented by other weapon systems such as Kinetic Anti-Drone Missiles or KADM. These are also known as Kinetic Defence Missiles (KDM). Each KADM is about the size and shape of a football so they are spoken of figuratively as “cannon balls”, “pinballs” or “bowling balls”. The term “carronade” is also often used for the launch system for the KADMs. KADMs are compact, low-cost weapons and a warship may have several magazines containing hundreds of KADMs. The ship may include facilities for manufacturing KADMs. The KADM magazines are connected to ports on the ship’s surface by magnetic tracks which to some are reminiscent of those on a pinball table or bowling alley. The last section of the track is a linear accelerator system that launches each KADM at a very high velocity. Each KADM is a chemically-fuelled guided missile capable of manoeuvre and further acceleration. The KADMs speed and mass give it a tremendous quantity of kinetic energy and a single hit can easily vaporize an attack drone or many larger craft. Carronades and their rounds are also known as “smashers”. KADMs are also sometimes used offensively. 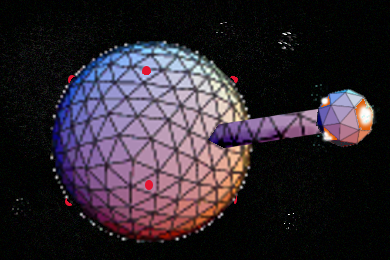 When in low orbit KADMs are fired in an orbital path to engage ships hidden by the planet’s horizon. Carronade KADMs may be supplemented by larger, longer ranged and more sophisticated anti-missile missiles along the lines of the Kirklin mines proposed here. KADMs and Kirklin mines are not official TS space warfare weapons, but worth considering for TS or other hard science space settings. Some TS spacecraft mount coilguns or electromagnetic guns. The railgun described next is a related but distinct weapon and recommended if you want a real gun turret on your spacecraft! Railguns are another potential defensive weapon for spacecraft. The railgun fires “shot” rather than X-ray or tungsten-pellet munition packs. Railguns are capable of accelerating a projectile at phenomenal speeds. A railgun round that penetrates a ship’s hull is likely to perforate a number of internal compartments as well, possibly punching out the other side of the vessel. Smaller targets hit by a railgun will be shattered, pulverised or even vaporized. A hit from a railgun can be devastating but in a vacuum a miss of a few inches will have negligible effect on the target. A railgun round may be accelerated at 20,000 to 60,000g and such forces pose considerable problems in creating guidance systems suitable for a railgun rounds. The majority of railguns therefore use unguided rounds. Acceleration forces also make it problematic to use unstable compounds such as explosives in railgun rounds. When a projectile’s velocity exceeds 3km/s the need for an explosive component is debatable since its kinetic energy already exceeds the energy of an equivalent weight of TNT. Railguns generally use solid shot, either of hardened steel or steel with a tungsten or depleted uranium core. Such rounds are relatively easy to fabricate with shipboard facilities. A 3” calibre railgun “slug” or “shot” for a 5” railgun masses about 33lb. Each round is acutely pointed to improve penetration but this point is covered by a cap of softer material (above) that reduces the chance of a round glancing off armour. Reflecting their naval ancestry, most railguns have a calibre of 5”/ 127mm. The “Aliens: Colonial Marines Technical Manual” suggests an incendiary railgun round where an inert material is vaporized by impact to form a directional plasma. Waste heat production and excessive wear are other factors the railgun designer needs to address. Instead of the 5” railgun some AKVs and smaller vessels mount a 3” railgun that fires a 57mm projectile of 15lb mass. The 3” railgun permits more rounds to be carried within a given volume. As an unguided, slower than light weapon the railgun round has a very short effective range against fast-moving targets. Aliens: Colonial Marines Technical Manual claims an effective range of just 100km for the Sulaco’s railguns. In TS the railgun is often one of the last lines of defence. While some capital ships mount railguns they are more common on smaller vessels such as frigates and gunboats. Railguns are useful as ground attack weapons and against slower, larger targets. The railgun may become an icon of future gunboat diplomacy. It is one of the few spaceship weapons that can be visibly trained on an enemy to intimidate them. It is also one of the most practical means to put a warning shot across the enemy’s bows. Laser and particle beams are invisible in a vacuum while drones are a resource not to be squandered.